Posted By:Unknown | At:10:41 AM Be the first to comment! WASHINGTON — President Barack Obama on Monday said he raised $71 million in June for his re-election campaign, after Republican candidate Mitt Romney reported $106 million during the same period. It was the second consecutive month that Romney collected more cash and underscores the challenge for Obama ahead of November. The grim news for Obama came as his campaign officials have publicly worried they were on track to lose the money race. Obama's campaign manager, Jim Messina, in an email to supporters just three days ago, said: "Their gap is getting wider, and if it continues at this pace, it could cost us the election." Obama is fighting on two fronts to keep the presidency: On one hand, he faces Romney's own war chest that pays for campaign operations. On the other, he has to push back against the hundreds of millions of dollars flowing to GOP-aligned "super" political action committees, or PACs, which have aired continual attack ads aimed at Obama and his record. Indeed, wealthy donors have been instrumental in helping Romney beat Obama. When he broke fundraising records last month, Romney's campaign praised small-dollar donors it said made it possible. But it was actually a small and often wealthy number of donors responsible, who gave an average of about $2,400 each, according to an Associated Press analysis. Like Obama, Romney often touts the high percentage of donors who gave less than $250, underscoring the perception that a large, grassroots group of Americans want him in the White House. 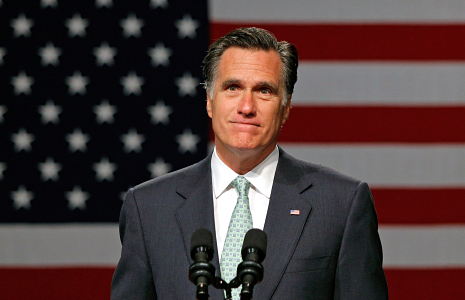 Romney's campaign said that about 94 percent of 571,000 donors gave those amounts in June, or about $22 million. But that leaves a little more than 34,000 responsible for the rest of the $83.8 million, the AP found. That's about $2,400 on average per person. Just as first-class passengers pay the bulk of an airline flight's costs, wealthy donors to Romney and Obama often make the difference for campaigns. Even for Obama, who harnessed the power of small, grassroots donations to help clinch the presidency four years ago, more than two-thirds of his supporters gave $200 or more. Both men have broad geographic appeal, with contributions from all 50 states and the District of Columbia. Discounting small donors would ignore an important measure of support for the candidates, particularly as Romney is gaining on the president in terms of cash left in the bank. Former Minnesota Gov. Tim Pawlenty, a Romney surrogate, said June's contributions point to an increasing grassroots-fundraising movement that he said is exceeding expectations. "People feel the country is on the wrong track," Pawlenty said in an interview. "They're hopeful and excited. And they're willing to chip in." Meanwhile, large contributors — up to the legal limit of $2,500 for the campaign during the primary and another $2,500 during the general election - are vital in an election whose cost might surpass $1 billion. In May, for example, a month after Romney began raising money with the Republican Party, he raised $76.8 million - more than Obama and Democrats by about $16 million. During that month, only one in six donors accounted for $64.8 million - or 84 percent - of that cash. The importance of high-dollar donors underscores the more than 100 fundraising events Romney has held since earlier this spring, in tony locales like Park City, Utah; Aspen, Colo.; and the Hamptons. Just this weekend, an evening dinner at the ocean-front Hamptons estate of billionaire industrialist David Koch cost $50,000 per person or $75,000 per couple. Obama's campaign hosts glitzy campaign events of its own, more recently at actor George Clooney's mansion in California. But Romney's fundraising surge underscores how wealthy donors are creating a financial challenge for Obama - who once assailed the influence of corporate money and super PACs. Republican-aligned super PACs, including Restore Our Future and American Crossroads, plan to spend hundreds of millions of dollars this election to defeat Obama. While Obama has super PACs working in his favor, they haven't harnessed the large sums of money that the pro-Romney groups have been able to do so far. As a result, Obama's campaign has said repeatedly and publicly that the president could be the first incumbent to be out-raised by his challenger. That message has come lately in the form of online fundraising pleas, asking supporters for small donations - usually $3 - to help push back against Romney. "We exceeded expectations - more than 706,000 people like you stepped up and pitched in for a grand total of $71 million raised for this campaign and the Democratic Party," said Ann Marie Habershaw, the Obama campaign's chief operating officer. "Bad news? We still got beat," she said. "Handily."